Among over fifty coordinated, local, and continent-wide demonstrations against explosive oil trains, dozens of Spokane Rising Tide (SPORT) and Wild Idaho Rising Tide (WIRT) climate activists from eastern Washington and northern Idaho participated in five events during the Idaho Week of Actions Against Bomb Trains [1, 2]. In the spirit of Big Oil resistance and solidarity with the thousands of frontline communities who live along railroad sacrifice zones across the continent, citizens gathered to honor and commemorate the 47 residents of the still-recovering, devastated town of Lac-Mégantic, Quebec, who lost their lives when a unit train transporting fracked Bakken shale oil in outdated DOT-111 railcars derailed and exploded on July 6, 2013. On the solemn, one-year anniversary of this terrible tragedy, despite dozens of additional oil train disasters, oil-by-rail shipments continue to increase in the U.S. and Canada, and similarly risky tanker cars carry crude Alberta tar sands and Bakken shale oil around and over northern Idaho lakes, through flammable, forested, mountain valleys, and across the urban core of Spokane, Washington. On Monday evening, July 7, a dozen people learned and discussed tactics and strategies for staging non-violent civil disobedience on railroad property during the Railroad Direct Action Skill-Share and presentation at the East Bonner County Library in Sandpoint, Idaho. As part of a series of skill-shares in communities along Northwest coal- and oil-transporting rail lines, Blue Skies Campaign volunteers from Missoula, Montana, talked about their recent experiences and insights drawn from two direct actions on or near train tracks in Helena and Missoula. Conversations in the library’s Rude Girls Room and later over pizza covered railroad security and law enforcement responses, coal train movements, protest logistical considerations, and opportunities for future, inter-group, regionally coordinated actions. If you would like to engage in these mostly coal train protests and upcoming conference calls arranging them, please contact WIRT or Blue Skies Campaign. WIRT participated in the Spokane Rising Tide action, Demand Safer Railcars, at the downtown Spokane office of Washington Republican Congressional Representative Cathy McMorris Rodgers (CMR), beginning at 12 noon on Tuesday, July 8 [3-5]. About a dozen protesters gathered on the North Post Street sidewalk below the fourth floor suite, with props representing an angry mob – cardboard and wooden pitchforks and torches provided by SPORT. They delivered a great letter written by SPORT’s Terry Hill that sadly could serve as a template for letters to hundreds of other so-called elected officials installed by corrupt industries to ensure their ruthless regimes of continued destruction of the planet and countless lives. The letter asked how the Congresswoman would protect the safety of her constituents and communities endangered by bomb trains, while she compromises her public interests by taking big campaign contributions from the oil and dirty energy industry and railroad companies. It requested that she and Congress ensure the security of rail line residents by removing outdated DOT-111 train cars from service. From within the potential Spokane blast zone of such trains, CMR’s staff members acted congenially, respectfully, and professionally towards the concerned citizens. They stated that they would forward the letter to CMR, and, when asked by the protesters, promised everyone who left contact information a response specific to their addressed concerns, not the anticipated, vapid, form letter filled with conciliatory comments. The visitors questioned CMR’s staff about the regularity and accessibility of the Congresswoman’s appearances in Spokane. The staff members suggested that the group of voters request a “coffee with Cathy” meeting as early as August. Returning to the street, the comrades energetically repeated five chants that Moscow and Spokane activists devised, hopefully audible in CMR’s office: “Rolling downhill, oil trains kill, 47 slain, no bomb trains!” “Pipelines spill, but bomb trains kill!” “While Cathy takes bribes, bomb trains take lives!” “Big oil bribes, railroad ties, Cathy’s corruption risks our lives!” and “Spokane oil trains, more every day, Cathy’s voters say no way!” The climate activists then huddled, noticed police entering the building, talked for a while, and dispersed. In memory of the Lac-Mégantic oil train disaster and in resolve for a moratorium on all regional crude oil shipments by rail, Spokane Rising Tide and Wild Idaho Rising Tide grassroots activists converged at 12 noon on Saturday, July 12, during the local Farmers Market, for the No Idaho Bomb Trains! March and Protest starting from Farmin Park in downtown Sandpoint, Idaho (See above, linked photos). Near the corner of North Third Avenue and Main Street, SPORT, WIRT, and regional citizens and friends gathered on Saturday with oil train protest signs, props, and, flyers, WIRT brochures, and voices. Instead of the planned activities of walking with highly visible signs through the congested core Sandpoint streets to train tracks along Lake Pend Oreille, and shouting memorable chants like those created for the Tuesday Spokane action, protest participants stood in the shade for several hours on that hot afternoon and shared crude oil train information with Sandpoint residents and visitors passing through the Farmers Market. As climate activists increasingly build a base of direct action practitioners in the Sandpoint area, the event yielded effective outreach and outcomes. 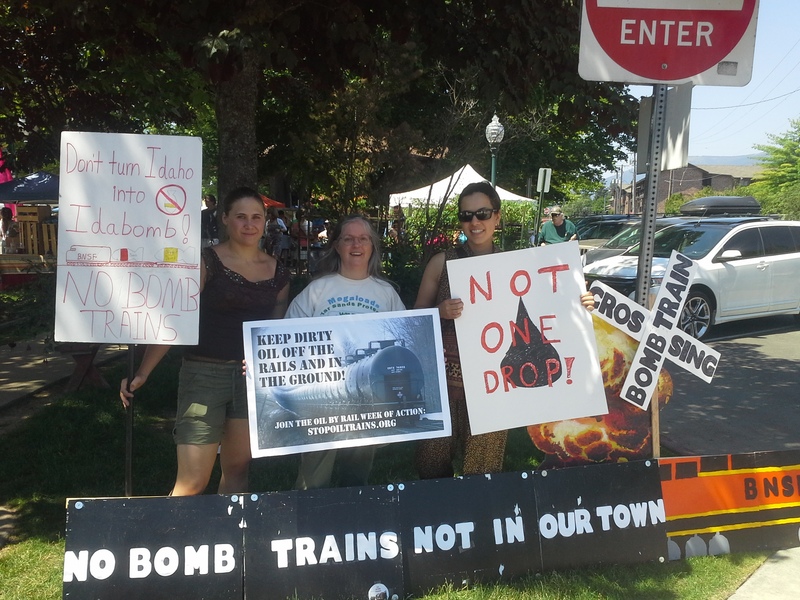 On Monday and Tuesday, July 7 and 8, and Saturday, July 12, Rising Tide activists also participated in two other ongoing activities for the Idaho Week of Actions Against Bomb Trains: watching oil train passage through the region and requesting public information about oil train numbers, routes, and timing from state emergency management agencies [6, 7]. As suggested by Vancouver Action Network allies in Vancouver, Washington, Northwest residents concerned about the unaccountability and threats imposed by Bakken oil bomb trains should start a train watch in their community and report any unit oil trains that they spot. Tweet the time, location, and direction of train travel, along with a hashtag, the two-letter state abbreviation, and oiltrainwatch (for example, in Washington state: #waoiltrainwatch). Contact WIRT if you can lead or assist this public scrutiny of oil trains on northern Idaho rails. A May 7, 2014 U.S. Department of Transportation emergency order requires railroad companies to only provide information about the total number of trains hauling at least one million gallons of this highly volatile crude oil, not the amount of shipped oil tanker cars intermixed with other freight on trains crossing each state. Idaho, Montana, and Washington have refused to sign confidentiality agreements with the railroads; thus, these states will release oil train records to the public. According to recently disclosed information from the primary railroad transporting this hazardous material across northern Idaho, Burlington Northern Santa Fe (BNSF) moves 13 to 15 trains with more than one million gallons of oil per week through “the funnel” between Sandpoint and Spokane. As most unit trains can transport 2.52 million gallons of oil, 13 such trains carry the equivalent of three Exxon Valdez spills through the region every week. A recent oil train watch and railcar count conducted by Spokane Rising Tide found about 70 percent more oil shipped than reported. This entry was posted in Coal/Oil Trains/Ports, Photos by WIRT. Bookmark the permalink.